San Francisco is sandwiched between two major earthquake faults. You can’t see them. But that doesn’t mean they’re not there. Some fault lines lie deep beneath the earth. 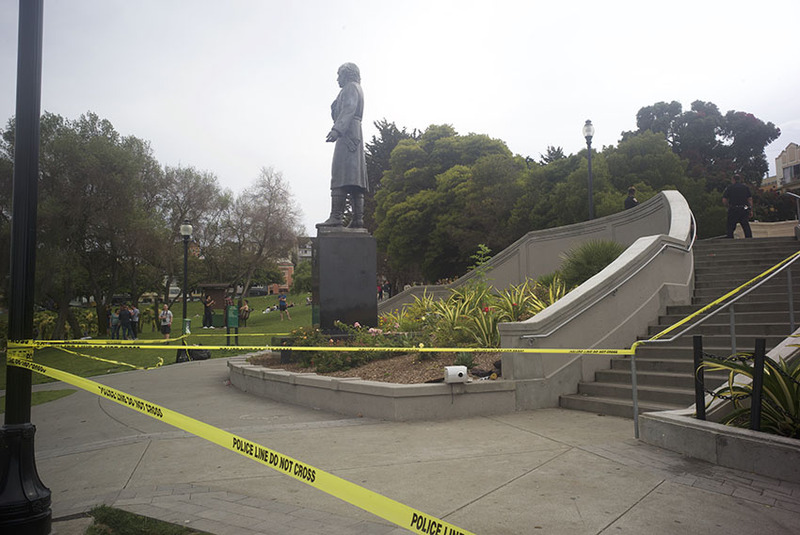 But some are man-made; earlier this month, one of the latter variety ruptured in Dolores Park. A confrontation near the footbridge over the J-Church tracks at 19th St. culminated in a brazen, daylight shooting. Three people were sent to San Francisco General, and scores of men and women lolling in the grass at San Francisco’s premier lolling site dropped their beers and ran like hell. San Francisco, like every city, has built over its past. But, at times, elements of the past come back into full view. And while the spectacular influx of cash into this city — and, specifically, the Mission — has transformed Dolores Park from a scruffy, lawless realm into a verdant DIY biergarten and expensive playground where tattooed, bearded men push Zelda and Brooklyn on the swings, that money hasn’t ameliorated the conditions that once made desperation and crime synonymous with this spot. The very bridge where gunfire broke out on Aug. 4 has, for generations, been known as an outpost for gangs and drugs. Per multiple San Francisco Police Department sources, this attack had everything to do with the former — but little, if anything, to do with the latter. Dolores Park, numerous SFPD gang and narcotics officers say, is the territory of the “Dolores Park Locals,” which they characterize as a Sureño clique. Over the past year, police say they have documented increased gang graffiti in the park; violence has flared up and tensions have been simmering (cops summed up other recent incidents, such as a May mob attack, as cases in which “outsiders” wandered into locals’ territory). Cops who work the park candidly say that, beyond serving as “a visual deterrent,” they don’t have any advanced notions of how to quell the next daylight shooting. If our sources are correct, the Aug. 4 incident — along with others preceding it — was likely not explicitly tied to drugs. In the past, however, that’s the hammer the police would have used to crack down on park mayhem — regardless of the cause. Responding to violent crime (and what appears to be directed gang violence) by engaging in a shotgun approach against pot dealers was the cops’ go-to strategy for decades. But the utter ridiculousness of even considering such a move in present-day Dolores Park — which could sweep up vast numbers of minor criminals and non-criminals and bearded men pushing Zelda and Brooklyn on the swings — reveals how problematic it always was. Doing away with buy-busts, veteran cops complain, is part of a larger trend away from proactive policing. A rich, citywide vein of snitches has been lost, they bemoan. “You wanna know what’s going on in Dolores Park?” postulates a longtime narc. “Go to 19th and San Carlos and jam those guys.” The gang member popped in a buy-bust in the Tenderloin might be the one to roll on his associates in the Mission. And, even without buy-busts, the narc continues, there used to be more of an emphasis on everyday, minor shakedowns — “humbugging ‘em” — in exchange for information. “You don’t even have to arrest them: ‘I’m gonna let you go, but next time, I need something,’” he explains. “It’s like breaking the ice with a woman.” The cops, he sighs, used to be players in this game. Now they’re just scorekeepers. And nobody is getting out ahead of the gangs. Does it make sense for cops to be posted in the park like scarecrows, pushing crime and trouble to the less-beautiful parts of town? Officers rattle off places where shootings and crime are inevitable — Third and Palou, the Tenderloin — but there is not a plan afoot to flood these areas, which have not yet received multimillion-dollar facelifts and are not ideal lolling spots. Why should people in Bayview and the Tenderloin be forced to accept misery and crime as inevitable? Is there a double-standard here? Cops ambling around Dolores Park will likely reduce incidents, just as an empty CHP car with flashing lights will induce drivers to slow around a curve. But it doesn’t even begin to address the root causes. It’s not designed to. And that’s the problem with reactive policing — and reactive policies and reactive politics and, yes, reactive reporting. You’re only reacting to what you can see. But there are so many things you can’t see, and won’t see. Until it’s too late, and that’s all you can see. This city is, literally, built on that. On Aug. 21, District 8 Supervisor Jeff Sheehy will host a community meeting to “discuss public safety with SFPD and other City agencies operating in the park” at 6 p.m., 455 Dolores St.
Joe Eskenazi has captured a lot of truth here. But maybe there is more. Maybe we are not destined to live the same day over and over. Last week I was able to hear Captain Bill Griffin, Mission Station SFPD give his take on the shooting. He promised not to walk away from Dolores Park. For now we will have an almost round the clock police presence on the bridge. Got to wonder if the Trump anti-immigrant rage is to blame for this dangerous situation. People know who did this, it happened out in the open at 3:30 in the afternoon, but the trust level with the police is really low right now. You might be on to something. Trump’s crack down on MS13 might be pushing MS13 gangsters into sanctuary cities like San Francisco where they have a layer of protection from deportation. That, or the new Mission demographic has created a strong demand for illegal drugs and the 2 gangs are fighting for the market share. It’s an inevitability that as Trump continues to enforce his policy our state will be one of the last refuges for these people. As much as I despise Trump, he is not to blame for this. We are to blame. This should never have been allowed to happen but, when former ILLEGAL ALIENS like David Campos find themselves in a position of power for years on end, and successfully appeal to lazy and braindead bleeding hearts, this is the result. Great story! Nice work on the essence of the situation. The thing is this is going on all over the city. We only have a firefighter style reactive ploice force because that’s what the citizens vote for with all of these feel good ploicies and politicians. The SFPD has been systematically deconstructed into the mere shell of a department it is today because activist and politicians beat it down like bad step father or better yet a pimp. Allowing amatures and activists to write policy and procedure telling the professional’sthey are not smat enough to understand what is necessary. It would be very easy to lower the crime rate in the city. In fact it would be very easy for SF to be the safest metropolitan city in the world. But the politicians don’t want that and the citizens keep voting for the opposite. You say the answers are not evident. They are right under your nose. Start with the schools system and work your way throught the DPH then to the biggest factor, the judicial system. All broken and abused just like the SFPD. You are so right. I was about to post a very sarcastic comment but perhaps it’d be best for me to agree with you and elaborate. Unfortunately subtleties and political correctness have not worked. It takes courage to speak truth to power and, at this point in time, it is of utmost importance for all of us to find the courage to clearly state our opinions and feelings. Nebulous no longer cuts it and, although I understand your message, it’s not likely to grab the attention of anyone who needs to be reached. “The essence of the situation”, as you say, is that gangs run rampant throughout the city with total impunity, and the reason is that the once great city of San Francisco has been destroyed by “progressive” Democrats who have chosen to misinterpret the original Sanctuary City policy, meant to protect ONLY REAL POLITICAL REFUGEES, into something that has, for well over a decade, come to include violent criminals and gang members. I can’t imagine how disheartening it must for the SFPD to have to abide by this ridiculousness and I do not blame any of them for having a bad attitude, if they do. This article makes clear that they know what goes on at Dolores Park but they’ve been deprived of their ability to control it in any way. They know these loser gang bangers are fully protected by the bastardized sanctuary city BS and, not only is there no point in arresting them, the SFPD is probably not allowed to arrest them. And even if they did, the gang bangers would most likely not be prosecuted because, as you’ve pretty much said, the judicial system in SF is completely out of whack after years of progressive idiots at the helm, such as the former Attorney General Kamala Harris who somehow managed to become a Senator. She’s contributed greatly to this mess, as have many others, including the former ILLEGAL ALIEN, David Campos who bears the greatest responsibility for the sanctuary city mess and so much more. I’m grateful for your thoughtful comment but the time has come for those of us who wish to effect change to speak in clear and name names. You can do it; I know you can. The real solution is to deport the illegals and crack down on all the scumbags loitering around on Mission St. You know who the likely criminals are if you’re a cop – it’s totally obvious. The Mission could be turned into a pristine paradise in less than 30 days if there was the will to do so.